Suffolk Naturalist: Warning! Pest Alert!!!!!! Well, it's blog time again and more findings are appearing on the list, although not many this week. Firstly and most importantly off all, I must post an alert! This is a tale of irony because I would love to come across this species of beetle, but, at the same time, I don't. Not in this country anyway, so hence the alert. I must say, working as a person who delivers containers direct from Asia, which is thought how this species arrived in the UK, I am always amazed at our lack of biohazard border control. If you land at Sydney airport in Australia with mud on your shoes, you're sent to be decontaminated or have your shoes confiscated and destroyed. They are very serious about non-native species getting into their country. I've been to places which have many containers delivered to them and some have little plastic bags on their walls with the remains of foriegn moths, lizards and beetles that they've found in the container. The containers are at sea for quite some time and it is unusual for most species to survive this journey. However, I was once shown an American Brown Bat which was found in a container of timber from America (obviously) when it was opened in Brentwood, Essex. The bat was obviously found very hungry and dehydrated and a bat worker was called to whom it is still in his care and will be until he dies (bat, not bat worker) because it cannot and should not be released in this country. 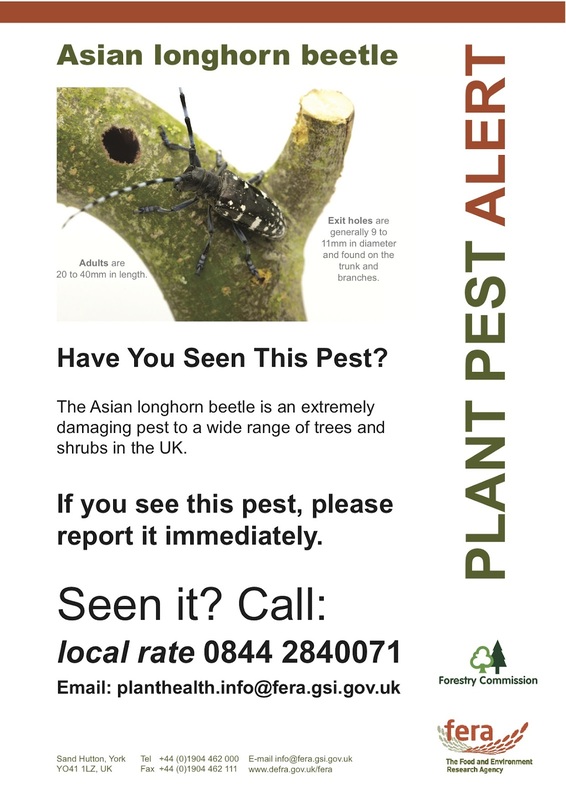 So, keep your eyes peeled because this species of beetle can do so much damage to our native tree population if it takes hold! Yes, thank you dear followers. Last week my views topped the 1000 mark and are still going strong, I'm humbled. 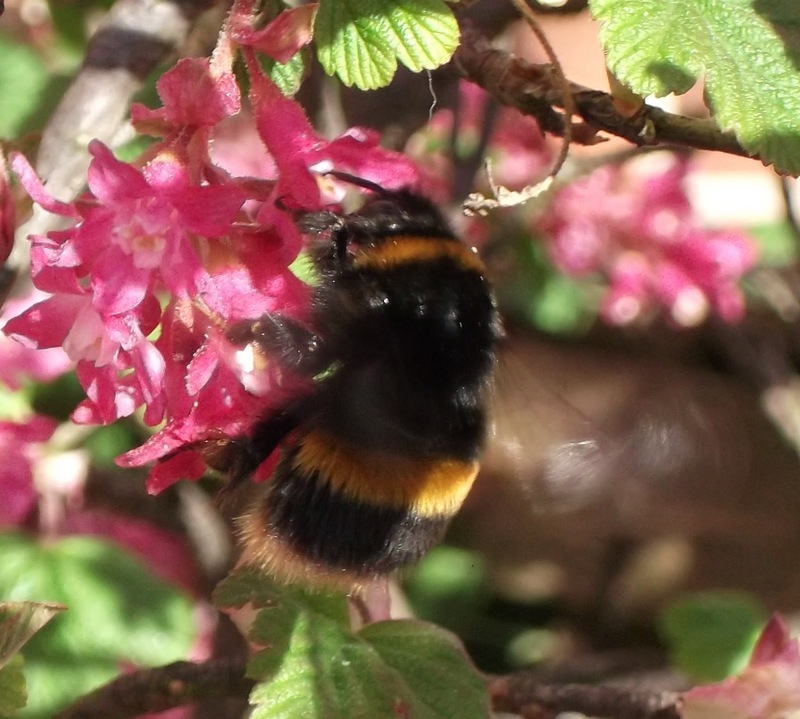 Bees, as you may have heard have been busy buzzing around with lots of big bumblers doing their business. When I got home from work the other day, I found a large bumbler (as the wifey like to call them) buzzing frantically at the window trying to get out. I helped it into a container and took it outside to our ornamental raspberry bush outside, where it immediately stuck its head into a flower and began feeding. It was then that I noticed there were some more bumblers using the bush to feed on. I ran indoors to grab my camera only to find out the battery was dead, great! So I grabbed my little point and shoot and started snapping away. On one little bush about 2 foot wide and 3 foot high I found 3 different species of bumbler, but only managed to get photos of 2 of the species. The species I failed to get a picture of was the one in my room, D'oh! 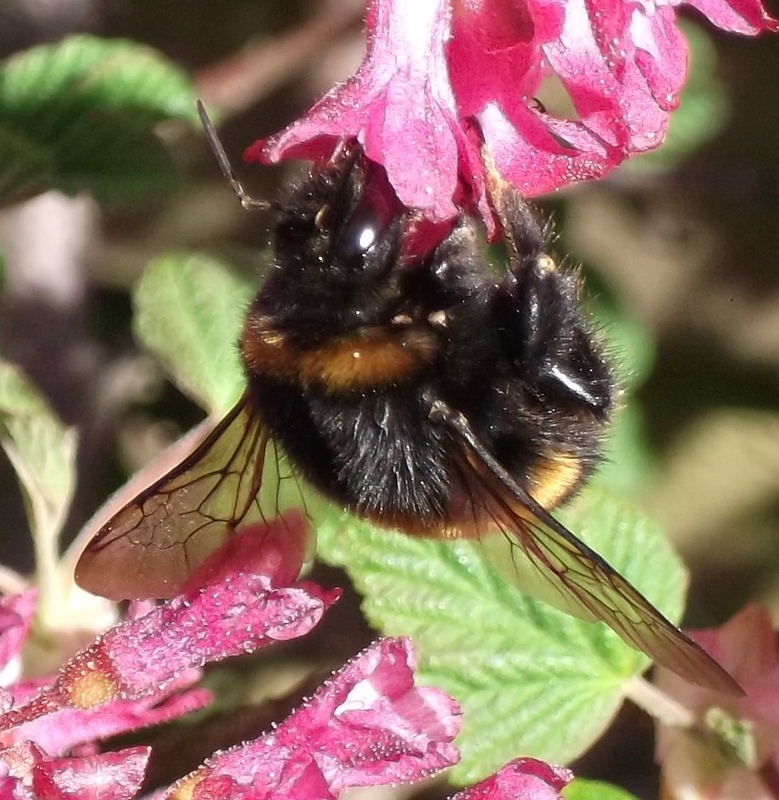 It was a Red-tailed Bumblebee Bombus lapidarius, the other 2 species were White-tailed Bumblebee B hypnorum and the Tree Bumblebee B lucorum. B hypnorum feeding on the Raspberry bush. I promise to post a photo of B lapidarius when I get one. 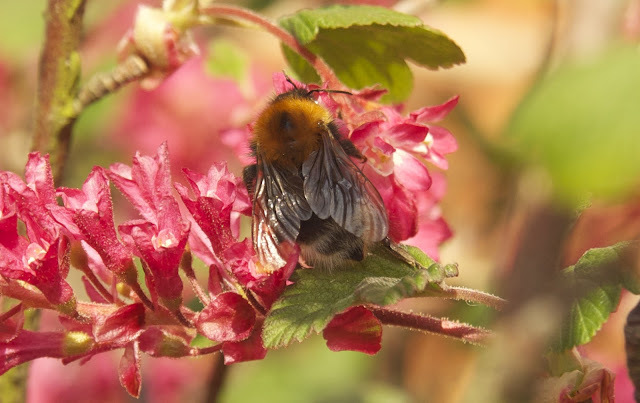 You may have heard in the news this week that queen bees are in decline due to pesticides, and we're not talking just agricultural pesticides either. They are suffering from the stuff that everyday gardeners use. Now bees and other pollinators have been having a hard time of it over the years with our messing around with flowers making them very pretty to look at, but totally void of pollen. Yes, you can, but how? 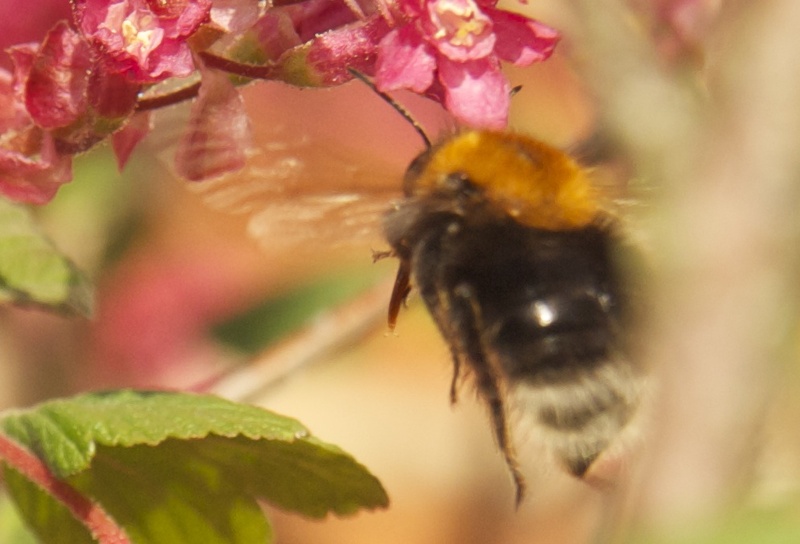 Start by planting pollinator friendly flowers in your garden like single dahlias or cornflowers and poppies. Have you got an old teapot you don't use? Then don't just chuck it away, bury the teapot leaving only the spout exposed, this makes for a great little home for most bumblers. Most importantly of all, please remember that a Bumbler isn't out to sting you! Their little stinger is barbed which means that if a bee stings you, when it pulls away, it'll leave its stinger in you ripping it out of his tail meaning certain death for the poor bee, so as you can imagine, the last thing it wants to do is sting you. If you leave them alone, they'll leave you alone, in fact they usually are quite happy for you to watch them feed as long as you don't interfere. Even wasps can be good for the gardener. Take the Ichneumon wasp, which I find most times in my moth trap, they will look out for those munching caterpillars on your prized plants, grab them and whisk them away to their hole in the ground where the caterpillar is then paralysed with a sting before laying its eggs upon it and being buried. The eggs hatch and devour their host (whilst still) alive, before becoming adults themselves to start the process all over again. A little beetle that I found on the moth trap sheet this morning also has its uses for the gardener, so much so, that it is being considered for use in pest control. 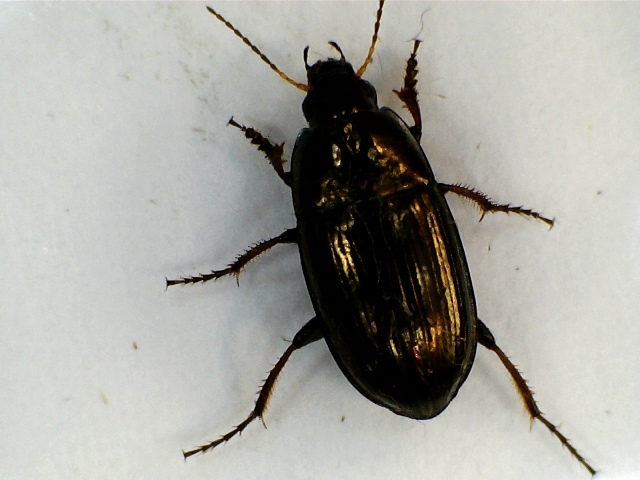 The beetle in question is the Common Sun Beetle Armara aenea and it predates on apple maggots and soyabean aphids. A aenea which has a lovely greeny-brassy sheen and is good for gardeners too! So yes, Friday night is Garden Moth Scheme and also known as 'Cat playground night' as the cat thinks it's the bees-knees when I have the trap set up in the garden. It gives him something to do whilst waiting for his mates to come round and play. Last night there was only one new species in the trap, a Twenty-plume moth (also known as the 20p moth) Alucita hexadactyla for which I had 2 of. I also had an all time record of Clouded Drabs Orthosia incerta which come in various different shades as can be seen below. O incerta in its various guises. Who said mothing was easy!!! SherylLaBouchardiere which I find quite enjoyable. The second is for those of you who are near a computer all day and is full of live streaming nature cams in nest boxes and out in gardens and it's 24hour too! It is Wildlife Whisperer and the link I give you here goes direct to the cams. Before I give you the list, I would just like to share this little conversation I heard about this week. 14year old girl: What's paraffin? Father: It's a fuel that is safe enough to be used indoors. 14year old girl: So it's not a cross between a parrot and a puffin then?